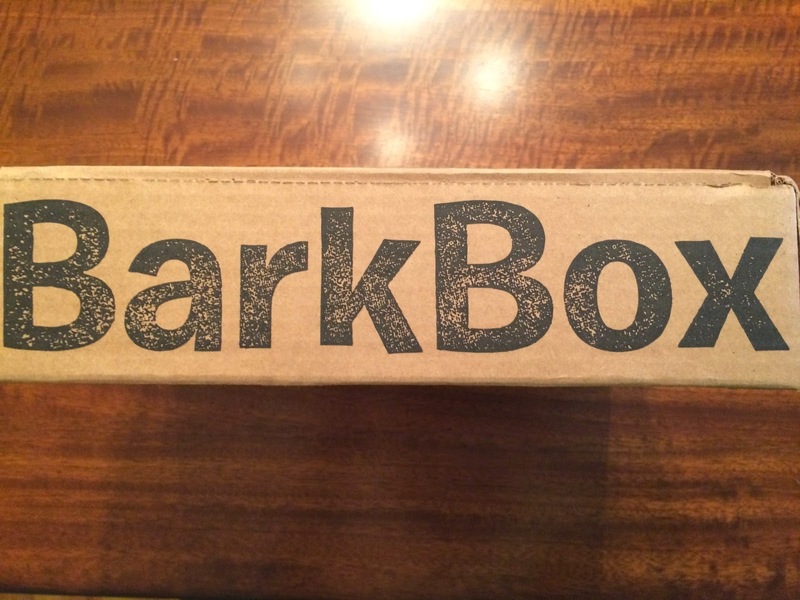 We just started getting BarkBox for our under 20 lb Shih Tzu. I wasn't sure what to expect, but I had looked at previous reviews and was happy with all the boxes, so we decided to give it a try. It arrived today and I felt the need to review it immediately. I always love opening a new box! Please excuse the bad pictures. It was dark when I took them, so you see the glare of lights. Sorry about that. And here is the first look. I love the tissue paper! 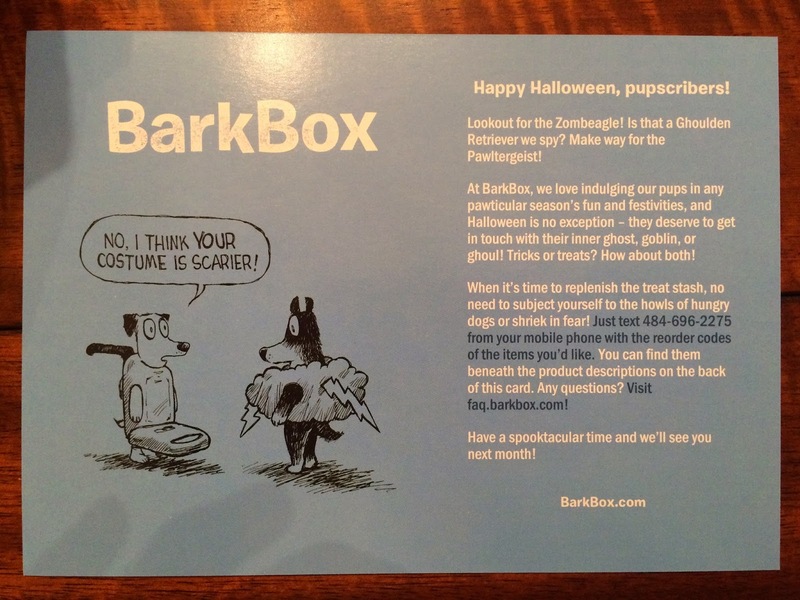 As with most subscription boxes, BarkBox included a card with the theme for the month and on the back it described everything included in the box. They also included prices and codes, so you could reorder the items. I love that feature! 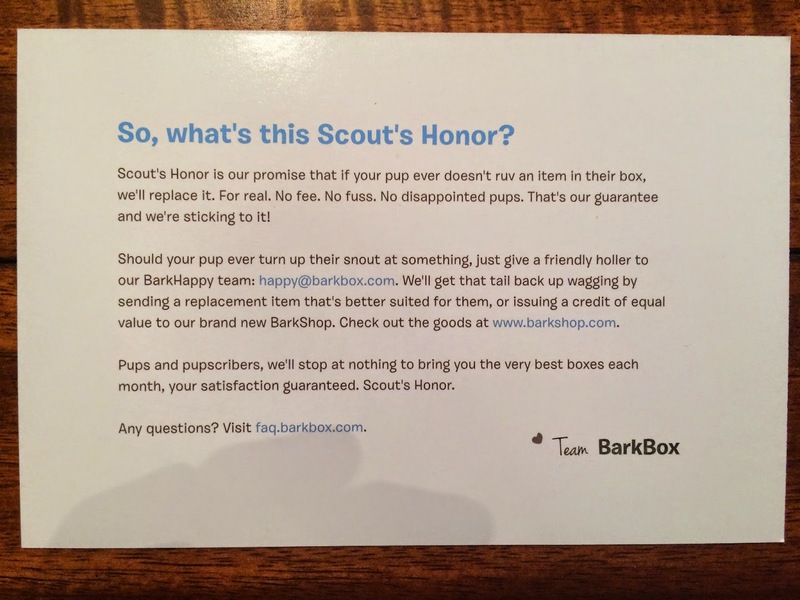 They also included a Scout's Honor card, which explains their promise that if your pup doesn't love something in the box, they'll replace it with no fee. Wow, when I saw this I knew this box was going to be amazing! Honestly, I was a bit worried about subscribing to a box for our puppy because he is quite picky about treats, but this policy takes all the worry out of it. And I'm not sure I knew this before subscribing, so I thought I should mention it. Ok, now onto what was included in the box. This is what I saw when I opened up the tissue paper. And it looked good! I knew my puppy was going to love what I was seeing. The first item that caught my eye was the GoDog Mopz Rhino. 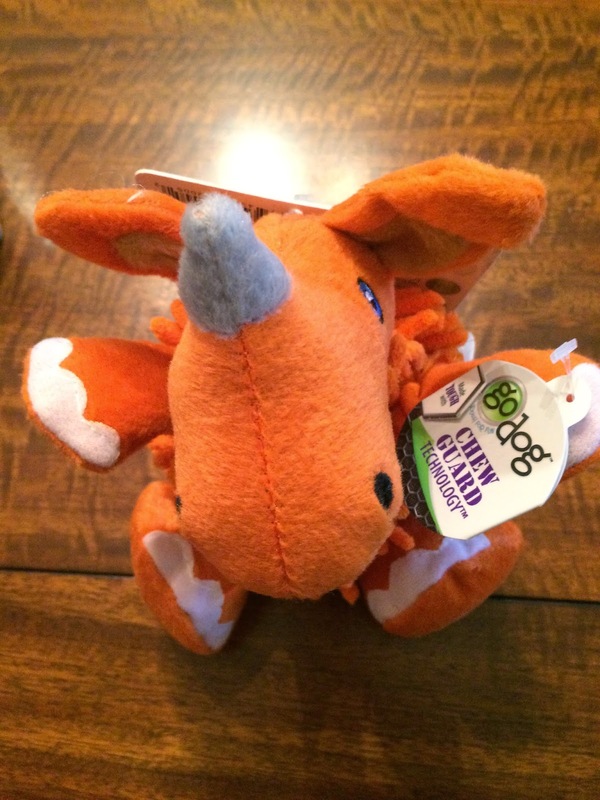 This is a bright orange rhino toy with a chenille belly and it has a squeaker inside. This is completely adorable and my puppy loved it immediately. First item I pull out and the box is already a hit with everyone! 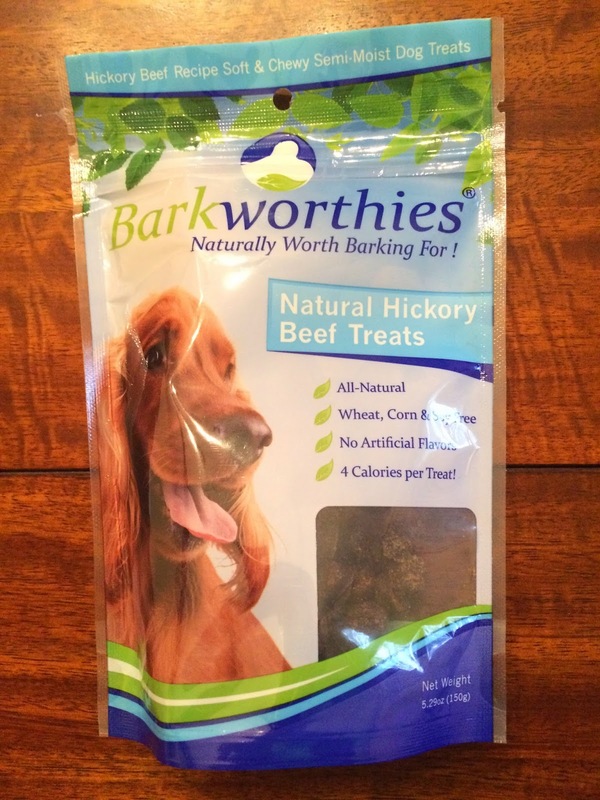 The next item was Barkworthies Hickory Beef Treats. This is a generous size of chewy dog treats that are wheat, corn, and soy free. He hasn't tried any of the treats yet, but these look like treats he'll enjoy. He has tried the Clear Conscience Pet Chicken Tender Stikz. 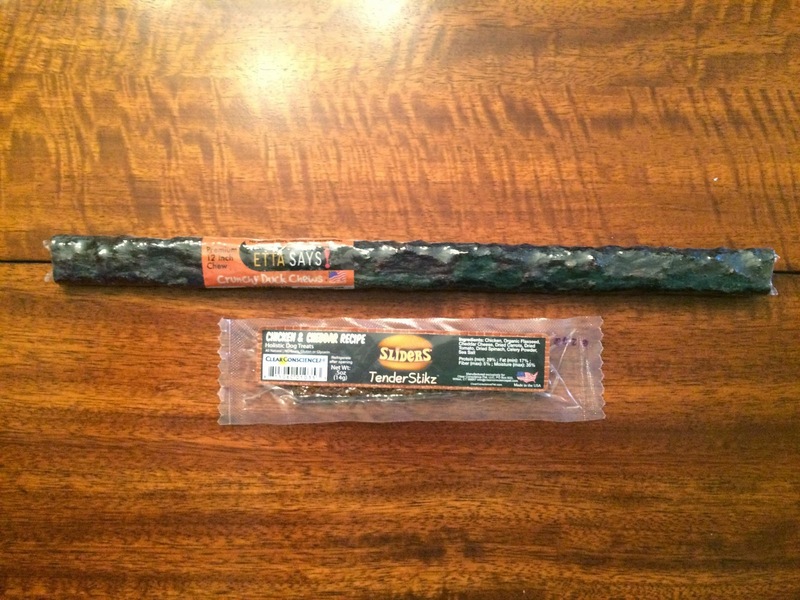 This is completely free of preservatives and is high in protein. It was a chicken and cheddar flavor. I wasn't sure if he'd like it, so we decided to try this one first. He loved it! I gave it to him and looked over a few minutes later and it was already gone and he was licking his lips! Also included was the Etta Says Duck Chew. This is a large chew, so we figured we'd wait to give him this one. He's never had anything like this, so I can't wait to see what he thinks of it. 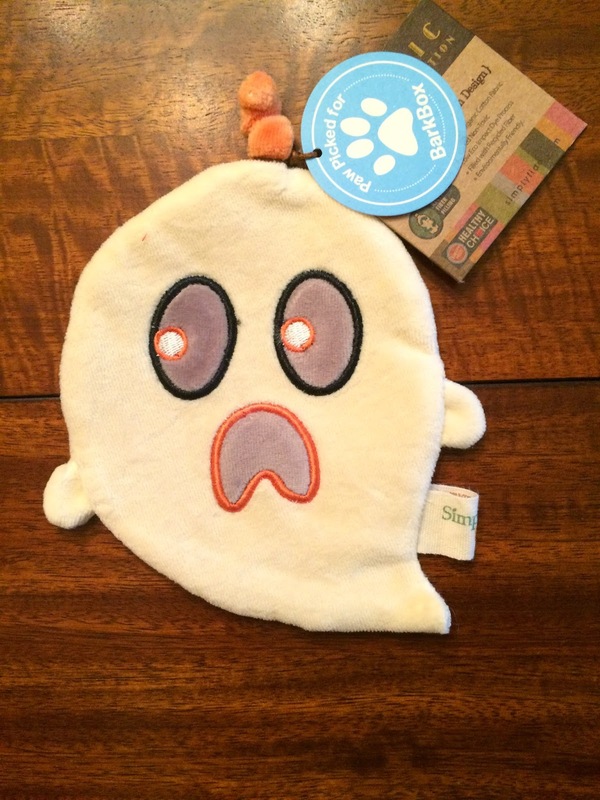 We also received the Simply Fido Ghost. 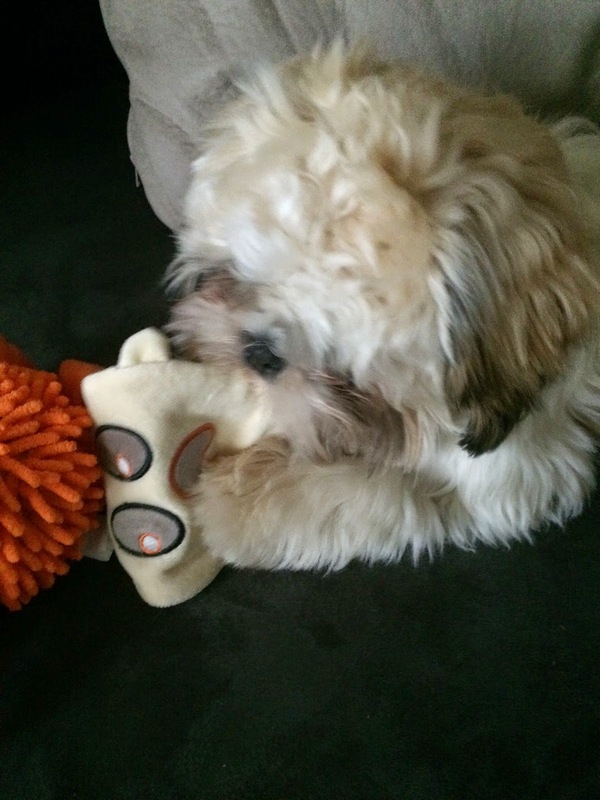 This is an organic cotton toy that was custom made for BarkBox. 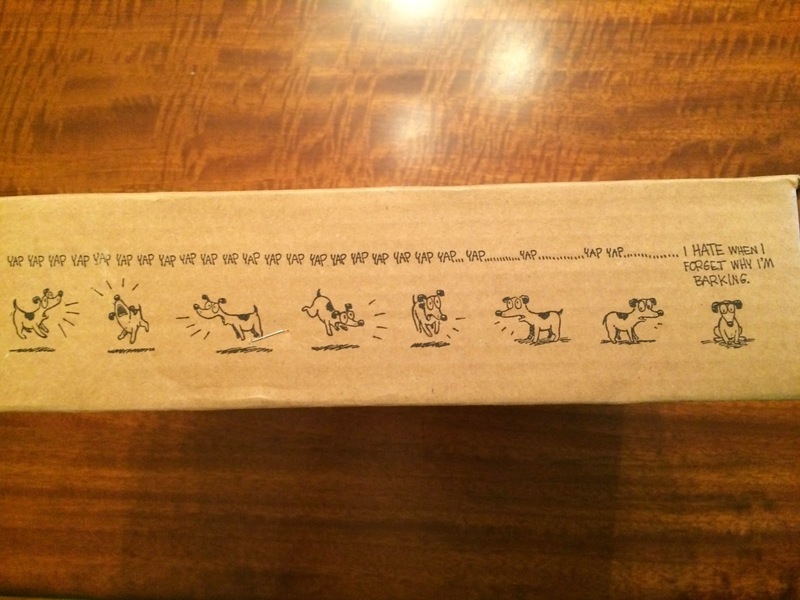 I always enjoy when subscription boxes have items made exclusively for them. And this is perfect for Halloween! 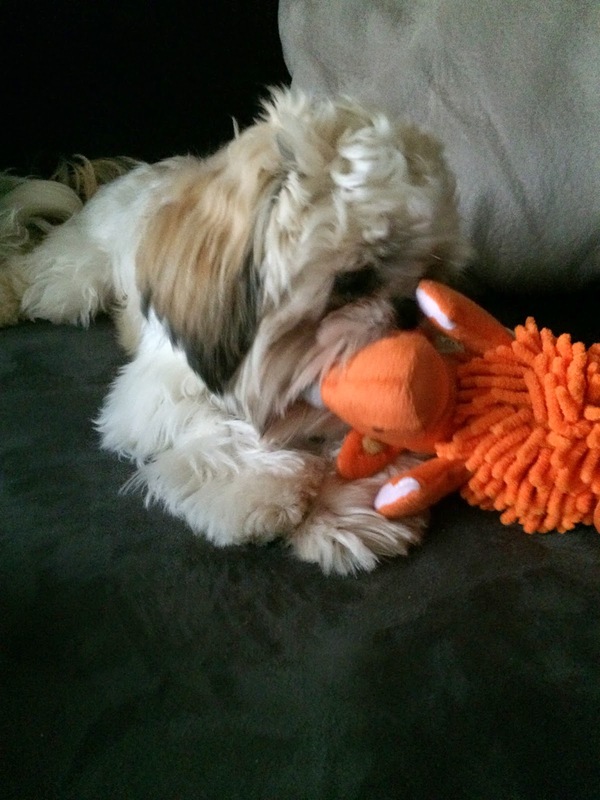 It's crinkly inside which our puppy loves. 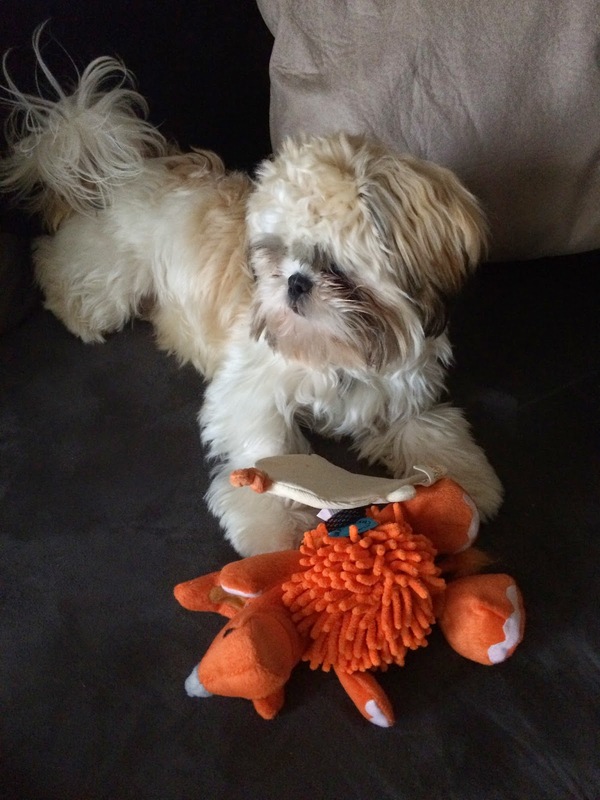 His favorite toys have always been the flat ones like these! 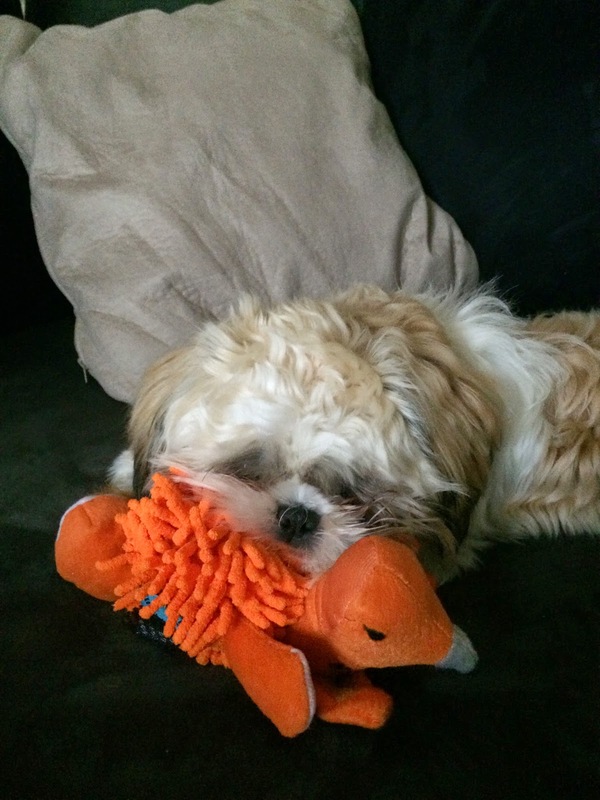 As you can see he loved both the toys and started playing with them immediately!!! 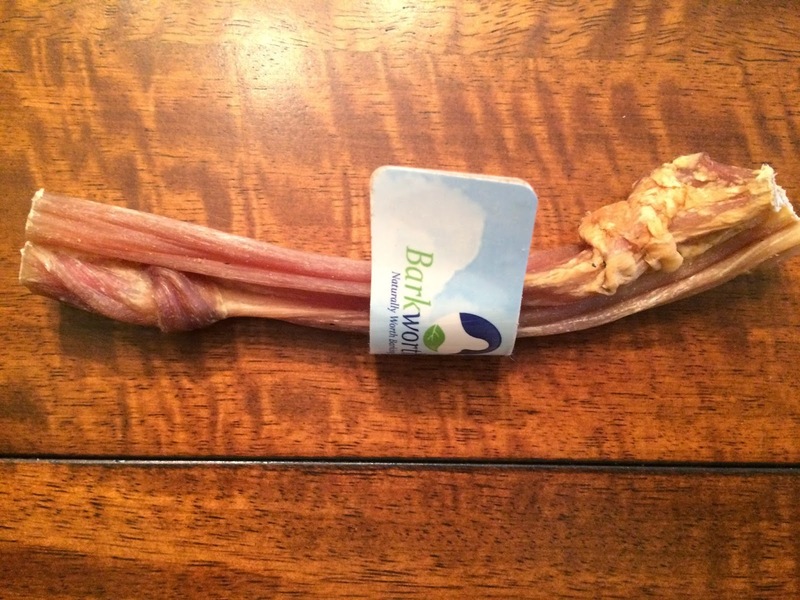 The final item included was a Barkworthies Odor-free Bully Stick. 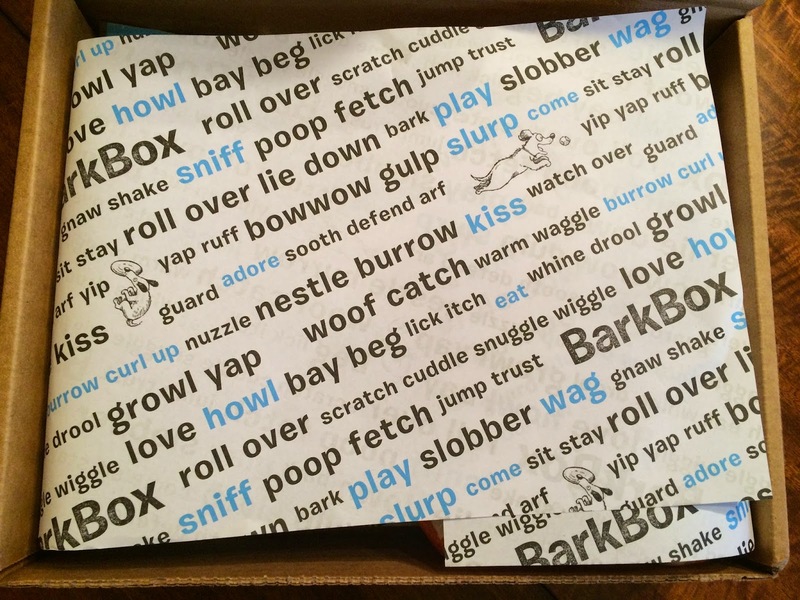 BarkBox describes this as the best canine "candy" bar around, so we're saving this one for a special occasion (maybe Halloween). I'm pretty sure our pup is going to love this one too! 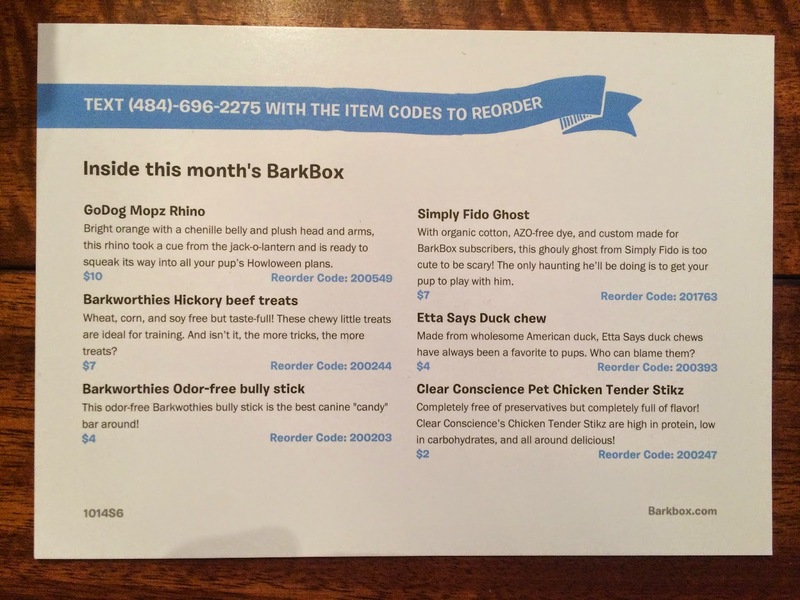 The quality of the toys and treats we received was much better than I had expected, so I'm very excited with this BarkBox and will definitely continue subscribing. I love that all the items are made in the US also. 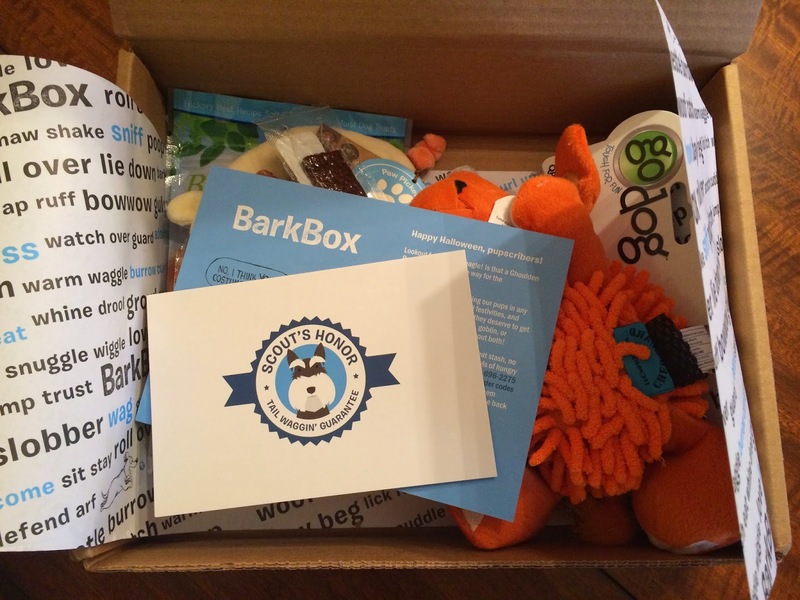 And it was a hit with the pup, so definitely a great box to start with! We received more than I expected. I thought we'd get one toy and a couple treats, but this seemed like a great value. Using the pricing on the information card it totals $34, which is more than what I paid for the box, so I'm extremely happy. And they are all new items we've never tried before! I can't wait to see what we'll get in November!! !